It may seem like we&apos;re just learning about the NSA&apos;s overreach thanks to Edward Snowden&apos;s revelations, but it turns out that the New York Times sounded the alarm on the dangers posed by the agency 30 years ago. Hopefully, the advent of the internet will help us remember the threats to our freedoms in a way that dusty print media never could. The NSA may use the internet to watch us, but now we can use it to watch them right back. "No laws define the limits of the NSA&apos;s power. No congressional committee subjects the agency&apos;s budget to a systematic, informed, and skeptical review. With unknown billions of Federal dollars, the agency purchases the most sophisticated communications and computer equipment in the world. But truly to comprehend the growing reach of this formidable organization, it is necessary to recall once again how the computers that power the NSA are also gradually changing lives of Americans — the way they bank, obtain benefits from the Government, and communicate with family and friends. Every day, in almost every area of culture and commerce, systems and procedures are being adopted by private companies and organizations, as well as by the nation&apos;s security leaders that make it easier for the NSA to dominate American society, should it ever decide such action is necessary." That&apos;s right. In 1983, the year that cell phones became commercially available, the Times warned us about the clandestine government outfit that would one day pressure Verizon and Apple to disclose the personal data on our cell phones. A year before Mark Zuckerberg was born, the newspaper was questioning the dangers posed by the agency that would eventually have access to your Facebook data. Amazingly, the Times article even goes on to describe how the NSA surveils communications and targets Arab American citizens, all under a tenuous banner of national security. So what happened? Why didn&apos;t people respond? Clearly, even though it had great foresight, the article was not enough to stop the NSA&apos;s pursuit of a massive surveillance state. I refuse to believe that people were any less concerned about privacy in 1983 than they are in 2013. Instead, I think we can blame a simple a lack of communication. The article was featured on a Sunday, and most copies probably landed in the trash. While it&apos;s unfortunate that the Times&apos; warning wasn&apos;t heeded, there is a bright side. The internet has completely changed the way we find our news. Had Glenn Greenwald&apos;s NSA exposé been published in 1983, or even 1993, most Americans would have likely never seen it, because it was featured in the Guardian, a British newspaper. In 2013, the revelation instantly reached the entire world. Our news is no longer limited by time or place, just by an internet connection. 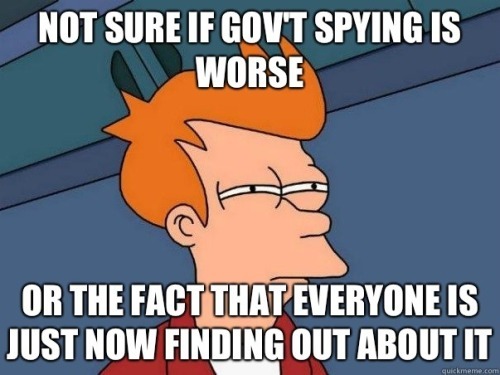 Now that millions are aware of and outraged by the NSA&apos;s programs, the news will not stop. It is simply supply and demand. As long as readers are searching for stories about the NSA, journalists will keep writing about it. The NSA scandal has been saturating every major publication for over 80 days, which is no small feat. Google News has a steady stream of such stories; just a few hours ago, another important article was published about the shadowy scope of the NSA&apos;s powers. Furthermore, the internet is forever, which creates accountability. Once a story breaks, it is virtually impossible to stamp it out. The New York Times recently altered a published article, softening its criticism of the surveillance state. Readers and other news sites were quick to screenshot the change and dig up archived copies of the original, putting a ding in the Times&apos; reputation. Unlike in 1983, we now have the tools we need to hold both government agencies and media outlets accountable, and to prevent important stories from falling through the cracks. It&apos;s just up to us to use them.